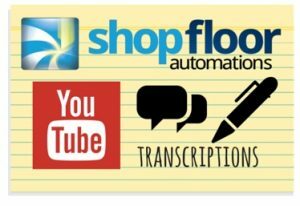 Shop Floor Automations has created a new line of videos on YouTube called Tutorials. This is a collection of helpful lessons on different processes a customer might have to complete. We value our customers highly and that is why we want to make it as easy as possible for them to get step-by-step instruction on issues they may have. If you cannot call us or cannot have another technician remote in, we encourage customers to visit our channel and check out the tutorial videos. If you are having trouble finding a video with the proper instructions please contact us and we will do our best to make a tutorial for your specific needs. We also have top quality technicians that can assist with any technical questions. You can see the new playlist here or visit the Shop Floor Automations YouTube channel here. We also have a list of transcriptions from our videos here.